This is a blend of demulcent herbs to soothe the throat and lungs, and expectorants to clear the lungs of gunk. Elecampane is great for wet, mucousy bronchial infections and is used for bronchitis, asthma, chronic lung ailments, and even tuberculosis. Coltsfoot helps dilate the bronchioles and expel mucus. Pleurisy root is great for the lingering cough that just won’t go away. Marshmallow and licorice help to coat the mucous membranes and soothe sore throats and dry coughs. I added tulsi tincture for its expectorant and adaptogenic properties, plus sage and thyme tinctures to help dry and clear mucous. Take 1-2 Tbsp, one to three times per day as needed. This delicious blend of roots and leaves is a potent and easily absorbable source of bio-chelated iron, as well as many other vitamins and minerals. It is also a wonderful support for your liver. As our body’s master detoxifier and processor of all we ingest, the liver is a very important organ to keep in balance. The liver also manufactures many of the building blocks needed for hormone production and helps regulate hormone activity. When addressing any imbalance, it is helpful to also support the liver. You can take up to 6 Tbsp daily if you know you are iron or mineral deficient or need extra liver support. I recommend starting with 2 Tbsp and see how you feel. If you experience loose bowels, reduce the dose and gradually increase it over time. dandelion, burdock and yellow dock roots, dandelion leaf, raspberry leaf, nettles, water, molasses, black cherry juice concentrate, and (optional) brandy. Yes, to be clear. To be open and moving and free. These are the qualities this tea brings in as our bodies awake from their winter stagnation. Nettles, dandelion and cleavers are all supporting our bodies to flush out the old and make way for the new. These spring weeds, plus alfalfa, make a mineral packed powerhouse of spring time energy. Holy basil (tied with nettles for first place as my favorite herb) is the great balancer in a group of plants known as adaptogens. Adaptogens support our bodies to adapt to stress of any kind (even the simple stress of a change of season). It also supports immune and respiratory function and sharpens memory. The sage helps clear out the sinuses and the licorice enhances the action of all the other herbs, plus adds its silky sweetness to balance all that green vitality. Yum. Steep 1 Tbsp per cup of hot water for 20+ minutes, covered. The longer it is steeped, the more minerals are extracted. You can even let it steep overnight. Ingredients: nettles, alfalfa, tulsi (holy basil), dandelion leaf, cleavers, sage, licorice (licorice is optional). These tiny little nibblets are packed with Vitamin C, as well as other vitamins, minerals and antioxidants. The raw honey is antibacterial and antiviral, containing vitamins, enzymes, and antioxidants that are destroyed in the pasteurization process, but retained when honey is raw. It is also anti-inflammatory and an expectorant, soothing bronchial passageways and respiratory distress. Eat 2-4 per day. Be sure to drink lots of water, especially when eating dehydrated foods to help your body re-hydrate. New things are brewing this year. I feel the excitement of spring in the air, even through the chill wind. This spring is the launch of our new Medicine Making Pick-up Parties. Members are invited to join us in the garden to learn more about herbal medicine. We will make some seasonal medicine together and provide more details about the CSA products for the season. So join us for a fun time in the garden! This is a wake up call to your system! It’s spring time! Time to get a move on and clear out all the old stuff that’s piled up over the holidays and the cold weather. It includes herbs that promote clear sinuses, clear heads, clear body systems. It’s also jam packed with vitamins and minerals to boost your system as you get more active. Holy basil and nettles can help with seasonal allergies as well! Made with all organic herbs: holy basil, nettle, alfalfa, cleavers, dandelion, sage, licorice. This blend highlights goldenrod (Solidago spp. ), which is not to be confused with ragweed (Ambrosia spp.) that blooms at the same time and is the cause of many people’s seasonal allergies. Goldenrod actually has astringent and anti-inflammatory properties that help reduce the body’s over-reaction to pollen and soothe the itchy eyes, congestion and fatigue that accompany seasonal allergies. And we have holy basil and nettles again (not only because I love them) because nettle acts as an antihistamine and holy basil is a superior adaptogen for supporting the immune system. Thyme and sage clear our sinuses and fight infection. Raw honey is anti-viral, anti-inflammatory and an expectorant, soothing bronchial passageways and respiratory distress. And if it’s local, then all the better to build your body’s resistance to allergies. Breathe well! This delicious blend of roots and leaves is a potent and easily absorbable source of biochelated iron, as well as many other vitamins and minerals. It is also a wonderful support for your liver. As our body’s master detoxifier and processor of all we ingest, the liver is a very important organ to keep in balance. The liver also manufactures many of the building blocks needed for hormone production and helps regulate hormone activity. When addressing any imbalance, it is helpful to also support the liver. 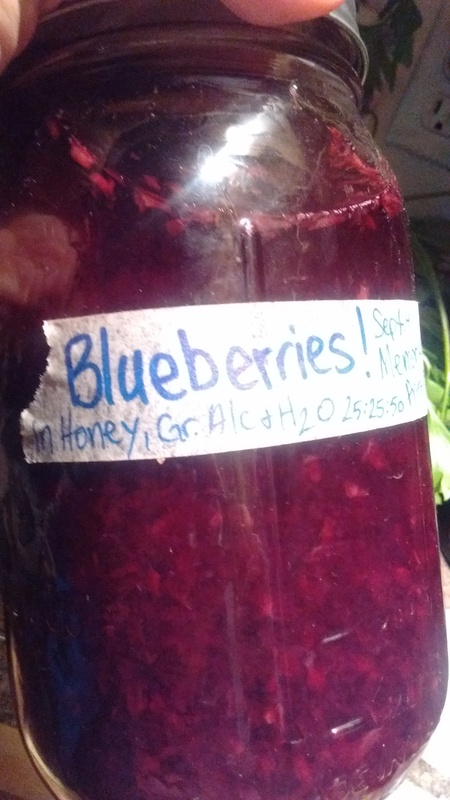 Made with all fresh, RI harvested herbs: yellow dock root, burdock root, dandelion root and leaf, raspberry leaf, nettles, honey, brandy, molasses, black cherry juice concentrate. And one more spring time weed. This little sticky friend “cleaves” onto anything it touches, earning it the nickname “velcro plant.” It is a mild diuretic and soothes and tones the kidneys and urinary tract. It is also one of the best ally for the lymphatic system. As I’ve read more about this complicated system of the body, I realize how much I didn’t know about it (isn’t that always the way? As we dig deeper, we discover our ignorance.). So the lymph system is the main cleansing mechanism of the body, flushing out toxins that are trapped in our tissues, sending them into the bloodstream to be cleansed by the liver and kidneys. Conditions like psoriasis, arthritis, swollen glands and some tumors are aided by the cleansing action of cleavers. It also works directly on the kidneys, soothing inflammation and infection of the urinary tract. Made with fresh, RI harvested cleavers in grain alcohol and water. This is a thick and highly moisturizing cream made with shea butter, cocoa butter, almond oil, calendula and chickweed infused olive oil, water, aloe and lavender essential oil. The water and aloe are slowly blended into the oils to create a thick, whipped creamy texture that allows the liquids to soak into your skin and stay locked in with the oils. Clay again! This time it works to draw out oils, makeup, and impurities in the skin. The slight amount of texture from ground up almonds works to gently exfoliate and leave the skin super smooth. The oats and flowers are nourishing and replenishing for the skin. Made with clay, organic oats, almonds, lavender, and rose petals. This summer was very full for me: moving, traveling, camping, digging our things out of storage and oh! digging in the garden in my free time. Thankfully, I had some support with harvesting at friends’ gardens and watering in my garden and the season was a beautiful (though weedy) success. I want to share with you the summer products that I made. And if there is ever something that looks yummy to you, let me know and you can place a special order before you commit to a full year CSA share. Also, you can join the CSA at any point in the year. So hop on in! What I really wanted, however, is the classic dark red hibiscus that colors tea pink with its brilliant pigment. So I tried to grow it this year, but the big beautiful buds never got a chance to open before the frost. Back to the drawing board for next year! So B. Radiant includes this beautiful red flower, but not in an overpowering red zinger kind of way. The tangy zing of this tropical flower is blended with other cooling and nourishing herbs, providing extra vitamins and minerals for these active months, helping your shine to your full radiant potential. The spearmint, lemongrass, lemon balm, hibiscus and orange peel give this blend a cool and fruity energy that’s delicious as an iced tea. The raspberry leaf, alfalfa, and red clover are super high in Vitamin C and A, the B Vitamins, iron and calcium. I added just a pinch of freshly dried stevia leaves for a subtle sweetness. Feel free to add honey for a sweet iced tea. I love this blend of water, vodka and oil as a carrier for the essential oils because it’s so easy to spray and so much less messy than pure oil. Also, I’ve read that fractionated coconut oil is easy to wash out of clothes. I have watched this specific essential oil blend repel mosquitos right in front of my eyes, so it is definitely effective in the backyard and on hikes for at least an hour. I can’t promise it will work for heavy clouds of mosquitoes in the deep woods, sorry! It should also repel ticks and other biting insects. Check out how this plant must have gotten its name! Look at that beautiful jewel of water held in the leaf. Jewelweed is wonderful for lessening the effects of poison ivy, and conveniently grows in among the poison ivy vines in the forest. Isn’t it amazing that nature provides exactly what we need, right where we need it? (here’s a more info on jewelweed, how to identify and use it: http://www.wildmanstevebrill.com/Plants.Folder/Jewelweed.html ). The other herbs help reduce skin irritation and promote healing. I add aloe vera and peppermint essential oil to each bottle for a nice cooling effect on the hot p.i. rash. I used a highly effective (so I’m told) essential oil blend from last year and mixed it with infused olive oil to make this muscle salve. I infused the oil with three great sore muscle and nerve pain healing herbs. The first is St. John’s Wort flowers (pictured above) that grow wild on the sides of the bike path here. St. John’s Wort oil is great at penetrating into the nerve endings, relieving pain and inflammation and is also an antispasmodic. The arnica flowers in oil are great for pain, inflammation and bruising. Cottonwood buds are also anti-inflammatory and helpful for arthritic joints. This blend features lavender, chamomile, lemon balm, frankincense; relaxing herbs that ease tension and stress. It also includes peppermint for cooling and refreshing the body. Lavender is specific for headaches, and is especially effective as an essential oil. Just smelling an essential oil sends the medicinal properties of the plants through the body’s limbic system and directly to the bloodstream and brain. So this is a repeat from last year because almost all of us need this at some point! This combines the famous Ginkgo leaf, harvested at East Farm in South Kingstown with other brain tonic herbs as well as blueberries for their antioxidant value. Ginkgo actually dilates the blood vessels to the brain, improves overall circulation in the body, strengthens arterial walls, reduces inflammation in the blood vessels and prevents blood clotting. Wow! Gotu Kola is also a vasodilator and “gently but firmly increases mental alertness and vitality by feeding and nourishing the brain,” says Rosemary Gladstar. Rosemary (the herb, not the herbalist) is also a memory aid and is good for circulation as well as reducing high blood pressure. Also a repeat. It’s just so perfect as we move into the colder weather and the holiday season where we tend to eat richer foods and sometimes more food than our bodies are used to. These miraculous herbs offer us the gift of a very under-used and under-appreciated taste. Bitter is the flavor that is suggested in Chinese medicine when the weather is turning colder at the end of autumn. “Bitter challenges the body, alerting it through taste that a complex food is being ingested,” says the Urban Moonshine website. When the bitter flavor hits the tongue, it signals the body to produce bile and enzymes for digestion. That’s my little guy in a catnip jungle. My catnip got so out of control this summer, it squished half of my sage on one side and some of my chamomile on the other. Sheesh, catnip, calm down! Ha ha, my dad would love that joke. Get it? (Read below if you need more info to get my unintended and amazing humor). This is a blend that my friend Lia (who’s also a b. tree member!) and I created with a group of homeschool kids during a healing herbs class. We love how the flavors blended so beautifully. Lemon balm is a wonderful nervine, meaning that it nourishes the nervous system, helping reduce stress and anxiety and providing a sense of well-being. The catnip and chamomile both have the dual properties of calming the mind and promoting sleep, as well as soothing the lining of the digestive tract. Ginger and fennel are both excellent after dinner digestive aids. They help with gas pains, indigestion, over-full stomachs, acid reflux, and nausea. Whoa, you can pretend to be a tiny ant in this picture, crawling through the massive violet flower forest. Be sure to check them out when they pop up next spring. They are delicious in salads, beautiful to make lemonade with, and so good at moving out the wintertime sludge from our systems. Roses and violets are also good friends to have around in times of sadness and heartache. They are both uplifting nervines, soothing the emotional body like a big hug. Violet is also known as “heart’s ease” because of its strong affinity for lifting a person out of sadness. And of course roses have long been associated with love and beauty. The incredible thing about these delicate flowers is that they also have strong medicine to combat serious illness. Violets have been used for all kinds of bronchial infections as well as sore throats and lymph blockages. Roses are antiviral, antibacterial, and astringent, making them great medicine for colds, flus and infections. I continue to be amazed and grateful for how much these unassuming flowers offer to us humans. This Autumn I gave my members a choice of three out of five different herbal preparations I made. I think it must have been a hard choice! 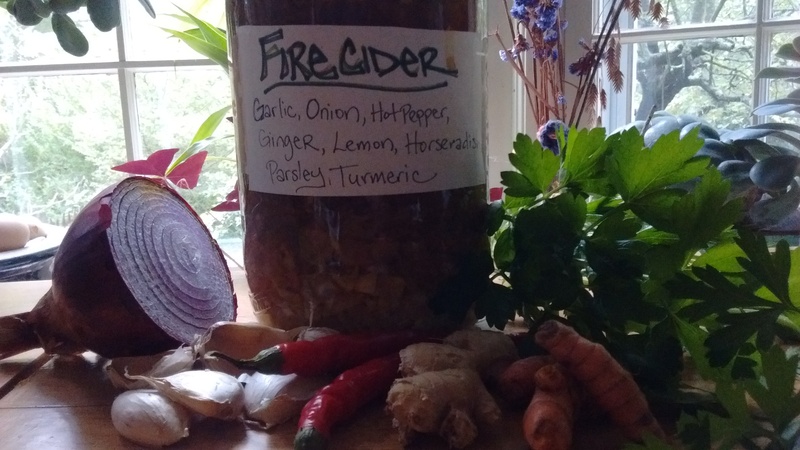 When autumn harvest time comes and farmers bring their garlic, onions and hot peppers to market, and some people catch their first cold of the season, I always think of Fire Cider. It’s a blend of spicy and pungent foods and herbs that are powerful anti-microbials, decongestants, circulatory stimulants and immune supporters. These ingredients are infused into raw apple cider vinegar, creating a delicious, warming liquid to sip on cold mornings with honey and hot water, or sprinkle on salads, stir-fries or stews. Vinegar is also a nourishing food in and of itself with many medicinal benefits. It creates temporary warming circulation of energy, improving a bad mood (especially in children). It helps reduce accumulations in the liver from a rich diet and is a digestive system tonic, helping with nausea. Vinegar relieves damp conditions such as edema, overweight, excess mucus and athlete’s foot. Organic, raw, high quality vinegars (apple cider, rice wine, white wine) are an excellent way of extracting the medicinal properties of plants, especially those that are high in vitamins and minerals. 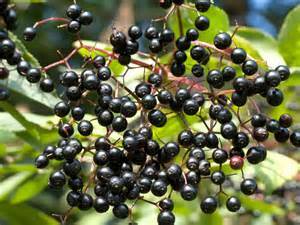 Elder flowers and berries are among the most popular cold and flu remedy in Europe and I hope you will see why! Elder is an immune system enhancer, but gentle enough to use every day (tho you might want to save it for when folks around you are sick). It’s also a diaphoretic, helping to induce sweating and reduce fevers. The syrup is so delicious, you can drizzle it on pancakes or mix it into yogurt or just drink it straight. Made with these two lovely ingredients pictured above, plus Rosemary from my friend’s garden, Gotu Kola from Mt. Rose Herbs and a splash of vanilla extract to smooth it all together. And don’t we all need this?! Well, most of us anyway. This combines the famous Ginkgo leaf, harvested at East Farm in South Kingstown with other brain tonic herbs as well as blueberries for their antioxidant value. 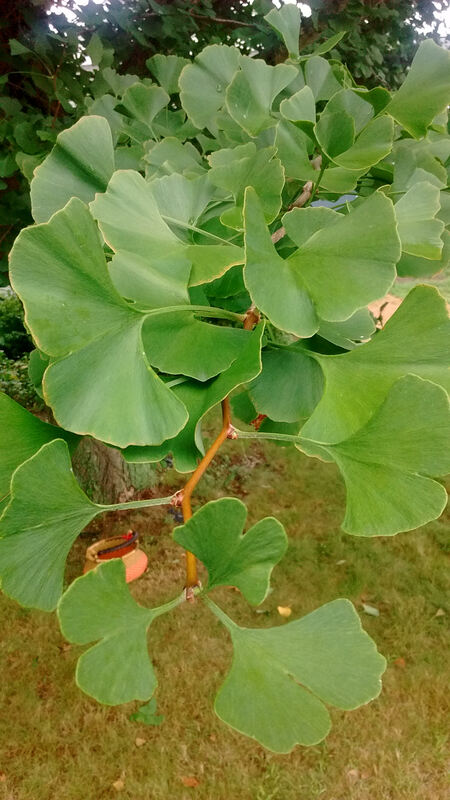 Ginkgo actually dilates the blood vessels to the brain, improves overall circulation in the body, strengthens arterial walls, reduces inflammation in the blood vessels and prevents blood clotting. Wow! Gotu Kola is also a vasodilator and “gently but firmly increases mental alertness and vitality by feeding and nourishing the brain,” says Rosemary Gladstar. Rosemary (the herb, not the herbalist) is also a memory aid and is good for circulation as well as reducing high blood pressure. Whoa, that’s a big dandelion root (and picture). Yes, this is the main ingredient in my digestive bitters blend. It also includes local fresh artichoke leaf and chamomile flowers with dried gentian root and angelica root. These miraculous herbs offer us the gift of a very under-used and under-appreciated taste. Bitter is the flavor that is suggested in Chinese medicine when the weather is turning colder at the end of autumn. “Bitter challenges the body, alerting it through taste that a complex food is being ingested,” says the Urban Moonshine website. When the bitter flavor hits the tongue, it signals the body to produce bile and enzymes for digestion. Featuring this local weedy beauty: St. John’s Wort, along with Cottonwood buds that I harvested in the Pacific Northwest and dried Arnica flowers from Mt. Rose Herbs. I brought back the highly effective (so I’m told) essential oil blend from last winter and put it in the oils I infused with these three great sore muscle and nerve pain healing herbs. St. John’s Wort flowers infused oil is great at penetrating into the nerve endings, relieving pain and inflammation and is also an antispasmodic. The arnica flowers in oil are great for pain, inflammation and bruising. Cottonwood buds are also anti-inflammatory and helpful for arthritic joints. This is a blend of some of my favorite herbs. Nettles are here again (as in the last two blends) because they just couldn’t be left out of a blend that has so many minerals, specifically ones that strengthen bones, muscles, and tendons. The horsetail is full of silica which is important for tendon and ligament health, especially for you active types and Oatstraw is full of calcium and you know what that’s good for. Holy Basil is my other favorite herb besides nettles. It is the great balancer, formally known as an adaptogen. It helps our bodies adapt to changes and stressors in our lives, and has a special affinity for the immune system, helping to strengthen it over time. The blend is rounded out with rosehips and rose petals, bringing you Vitamin C and a happy heart. These are the products that my CSA members chose from this season. Everyone got the B. Rooted tea blend and then chose 4 of the other options. I hope everyone is enjoying their goodies! This is a blend to support your immune system and bring you a grounded, warming energy. Astragalus is an important herb in Chinese medicine used to strengthen the immune system’s ability to resist infection and chronic imbalance. It is energizing for the entire body, particularly the spleen and lungs. Licorice is another energizing herb. It is used to treat adrenal exhaustion and is anti-inflammatory for the respiratory system. The roasted dandelion flavor reminds me of herbal coffee blends, adding liver support and toning the kidneys. Rounded out with more vitamin C from orange peel and rosehips and the rich, sweet notes of rooibos, I hope this tea brings you wellness and rooted contentment. This tea is much more dense and heavy than the leafy teas, so you can use less and steep for less time. Steep ½ Tbsp. per cup of boiling water for at 10- 20 minutes with a lid. For a stronger flavor, simmer on the stove for 15+ minutes. 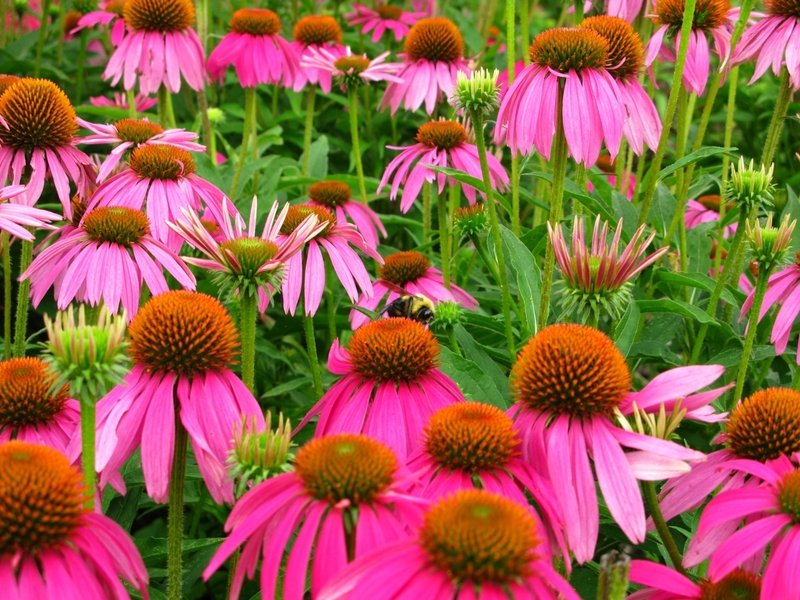 Echinacea is a strong and effective immune system support herb, that is still safe for children and elderly, having no known side-effects. It is fascinating how this plant works; it is actually increasing the T-cell activity, or white blood cells in the body, thereby boosting the body’s first line of defense against colds, flus and other illnesses. It is used preventatively and curatively with wonderful success. 10 drops every 2-3 hours or 1-2 dropperfuls 3 times per day. (A dropperful is equivalent to ¼ tsp or 35 drops) Use at the first signs of illness. Best to use in rotation: 5 days on, then 2 days off until sickness has passed. Then take a break until you need extra immune support again. This is a blend inspired by my friend Lauren Giambrone at Good Fight Herb Co. (http://www.goodfightherbco.com/), and I hope you love it as much as I do! It’s a blend of heart tonic herbs and some herbs that are traditionally used as aphrodisiacs, but work well for loving yourself. I used fresh hawthorn berries picked by another herbalist friend in NY, Tracey Picard (http://fellowworkersfarm.com/), which have the amazing ability to gently stimulate or depress the heart’s activity as needed. They improve circulation, lower blood pressure, and help maintain healthy cholesterol levels. Hawthorn and rose are both remedies for “broken hearts,” aiding in depression and anxiety and helping a person express their feelings and open their hearts. Motherwort is the “herb for mothering mothers,” and is wonderful for easing tension or deep emotional upset. It is also a heart tonic, nourishing and strengthening the heart muscle and blood vessels. The damiana and vanilla are all about the self love. May you continue to nourish yourself, take time for you, maintain healthy boundaries, and open your heart to the love that surrounds you. Eat 3-4 per day. Be sure to drink lots of water, especially when eating dried food to help your body rehydrate. Holy mole, it is quite a challenge to make candy with 100% honey. So after much trial and much error, I succeeded in two small batches of hard lozenges and decided to turn the rest to syrup. These are a blend of demulcent herbs to soothe the throat and lungs, and expectorants to clear the lungs of gunk. Elecampagne is great for wet, mucousy bronchial infections and is used for bronchitis, asthma, chronic lung ailments, and even tuberculosis. Coltsfoot helps dilate the bronchioles and expel mucus. Marsh mallow and licorice help to coat the mucous membranes and soothe sore throats and dry coughs. Take 1-2 Tbsp, one to three times per day as needed. Keep the syrup refrigerated! This turned out to be an awesome, creamy soap full of skin nourishment. I infused the fresh calendula flowers in olive oil last summer and am so glad for a chance to use more of it! This bright and sunny flower is an amazing herb for the skin, as well as a good anti-viral when taken internally. It is a vulnerary herb, meaning it promotes cell repair, and it acts as an antiseptic on wounds. Used topically it is soothing to itchy rashes including eczema, wounds and burns, including sunburn, pimples, herpes sores, and fever blisters. It is also anti-fungal and helps relieve athlete’s foot, jock itch, yeast and other fungal infections. All this added to the creamy nourishment of RI goat milk, fair trade shea butter and cocoa butter makes a yummy skin experience. Lavender is not only a nice smell. It is a strong nervine, supporting the nervous system and acting as an antidepressant, soothing anxiety, stress and tension. It offers relief for headaches and insomnia. Just smelling this herb has a direct effect on the body through the limbic system, connecting what we smell directly to our blood stream. So breathe deeply and feel at peace. Introducing….B. Tree Apothecary….Bringing the Magic of Healing Plants to You. Harvesting and making plant medicine is an inspiring experience, strengthening my connection to the natural world and to my own health. Now I would like to expand my practice and offer what I make to you. Here’s the deal: Sign up to receive a box of herbal medicine products each season and I will create seasonally appropriate medicine for you, plus recipes and info about each of my products. All ingredients are organic and plants are locally harvested whenever possible. Each “share” will include a tea blend for the season plus four more products. Shares will be available April, July, October and December 2016 and are $50/month, $200 for the year. You can pick them up from me or we can arrange a drop-off location based on your needs. Mailing your share is also an option if you live out of state, but still want some herbal-lee love! Let me know if you’re interested! Or if you know someone who might be. Happy early spring! May your season be full of health, nourishment, and abundance.